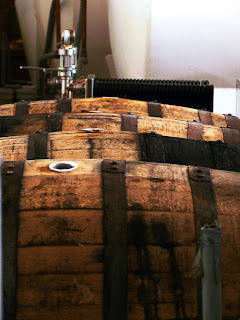 Right off the heals of a very successful “Wood-Aged Beer Celebration”, in Grand Rapids, Michigan, Brewery Vivant’s co-owner Jason Spaulding spent some time to answer a few questions with BeerGeeks.ca. This Brewery / Restaurant is a rising star in the Michigan craft beer scene. Definitely a place that is not to be missed. 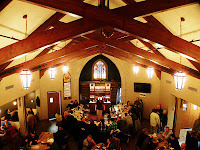 Great food paired with great beer, all in a family friendly environment, make this a beer lovers destination of choice. was packed all day for you. A. We had a great response. People were digging all the sour beers we could throw at them. I was not sure if the beer market would be mature enough to pull some of these off but they drank everything we gave them and came back for more. Q. Can you give a brief history of how you started in brewing and the inspiration behind Brewery Vivant? A. I started homebrewing in College with my friend Brett. It was just sort of a hobby, but as we got closer to graduating we started really thinking about the lack of breweries in Michigan. As all homebrewers do at some point during a brew, we started dreaming of what kind of brewery we would start. This dream kept building up steam and every other option for a college graduate started to fade into the background. With some luck, and some crazy negotiations with banks we actually pulled it off. That is how New Holland Brewery was born. My mother was convinced that we must have gotten mobster money or something because we were only 23 at the time. However, we were just so passionate about our plan that we were able to convince some investors and bankers to buy into our plan and give us a chance. I ended up leaving New Holland in 2005 to Brett so I could start my own gig. Five years later, Brewery Vivant came to be. Brewery Vivant was born out of a passion for the farmhouse beers of the Wallonia region in southern Belgium and northern France. When I was over there my wife and I visited all these tiny farm breweries that were making these wonderful beers unlike I had ever had back in the States. I loved the passion these French and Belgian brewers would bring and dug their almost defiant rebellion to having their beers fit into a particular style guideline. Here in the Sates, everyone likes to define everything so they can rank them. That is fine for some things, but beer should just speak for itself. It is the brewer's art. Either you like it, or you don't. Either way a beer dinkier should just figure this out for themselves by trying the beer! Q. What are some of the challenges with working with a spouse? A. My wife and I must be gluttons for punishment because on top of starting a business together, we decided it would be a good idea to have a baby in the middle of all this. Our boy Oliver Saaz Spaulding was born nine days after the doors opened last year. So the challenges of the husband wife team get a little compounded. But we make it all work. We have had to get use to working in alternating shifts sometimes. One of us attends the meeting and the other conference calls in. Most the time things go pretty smoothly. our business plan but we did it in such a manner that we flushed out most of the big issues up front. This plan serves as our working business model where we thought through all the things we want to do and more importantly what we do not want to do. This has allowed us to steer clear of any major conflicts in what we want to accomplish with this brewery. Q. 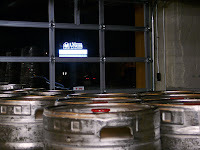 What were the biggest obstacles in opening the brewery and restaurant? A. Money. That is the biggest. Trying to finance a start up business with the bank industry acting like a bunch of scared little school girls was no treat. We had to raise a lot more private funds than we ever dreamed to pull it together. It was easier to get a loan the first time around when I was 23, right out of college with no experience, no history and no capital of my own than it was for this project. A. Yep. We pride ourselves on having a “from scratch” menu. Our chef has really gone out of his way to create a menu that catches people off guard. Most people go to a brewery expecting pizza and hot wings. We have a menu more like what you would find in the Belgian countryside. My favorite is probably our Country Pate. It goes great with the Triomphe IPA. Beers of course are all made on site too. We purposefully designed our brewery to be attached to the pub so we could have the beer as fresh as possible. It also make is nice for doing brewery tours because people can stop down and have lunch, get a tour and stay for some beers. We do them every Saturday at noon and 2:00pm. No need to call ahead, just show up. Q. What have been some of the challenges with packaging and distribution? Plans for expansion? Distribution in Ontario? A. Distribution is always a challenge. However I was able to keep a lot of friends in the distribution industry from my past and was able to team up with exactly the partners I wanted to represent our brands throughout the State. Having the right distribution partners that have the same passion for what you do as a brewery is half the battle. We are looking to get three more 60 bbl fermentation tanks in this winter. Once we have these in place we will be at maximum capacity at about 5,000 bbls per year. Our plan is to stay small and stay true to our craft. We don't have any plans to expand. Our whole goal was to build a sustainable neighborhood brewery and we are pretty happy with everything so far. If we can keep our locals supplied with beer and sell our extra capacity to our immediate region, then we will have executed our plan and don't want to sway from that. This goes sort of anti-capitalism where the goal is to grow, grow, grow, but we subscribe to a philosophy I learned in a book called “Small Giants” by Bo Burlingame, where companies choose to be great, rather than large. Q. 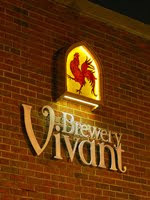 Where do you see Brewery Vivant in the next 5 years? A. My hope is to continue to experiment and develop our specialty line of beers that we are so passionate about. I want to create a destination brewery where people travel to Grand Rapids just to see us and drink our beer. I hope that when people think of Michigan, and specifically Grand Rapids that Brewery Vivant is at the top of their list of places they have to go. Not sure if we can do that within 5 years but we are going to give it a shot. With an incredible loyal, passionate and friendly staff, I am sure that Brewery Vivant is going to continue to thrive over the next few years. This coupled with the “house made” everything is a beer and food connoisseurs paradise. Be sure to put this on your list of “must visit” beer locales.